I will take pictures and post tomorrow. The leaves on my tomato plants are curling up, not on all of them?? 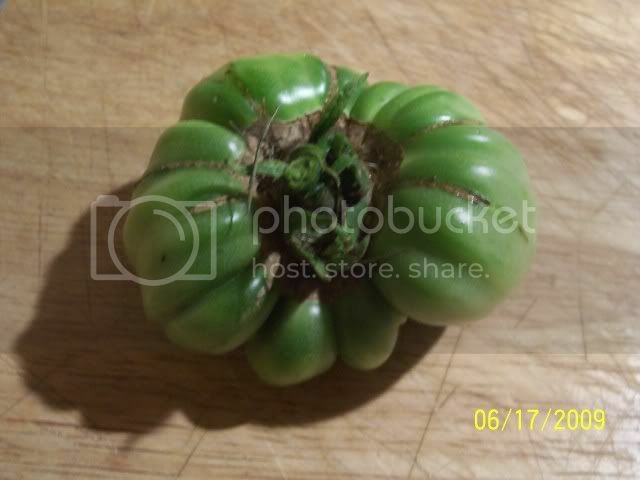 And some of my tomatoes are like split, not cracked but split with this little not in between the split??? I can't envision what you're describing. My understanding is that tomatoes split when they are allowed to get too dry and then are heavily watered. I could easily be wrong, though! This may be a learning opportunity for me! I apologize for not posting pics when I put this on here, but I will add them tomorrow. I have not ever seen tomatoes do this before?? I agree with Kisal that the cracks are from inconsistent watering. They will either crack or form "rings"...that's the best way I can think to describe it! Curling leaves?? Sounds like watering issue as well. 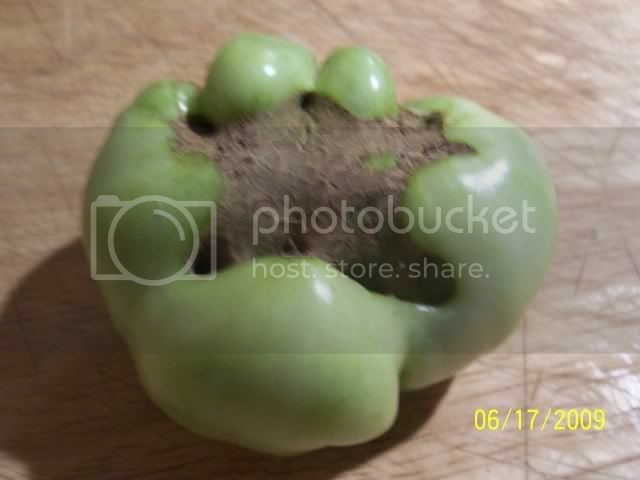 Ok I am sorry for not doing it sooner, but here are the pictures of the awful looking tomatoes!!! I don't think that it is from the watering but I am not totally sure???? Well My pictures are up! 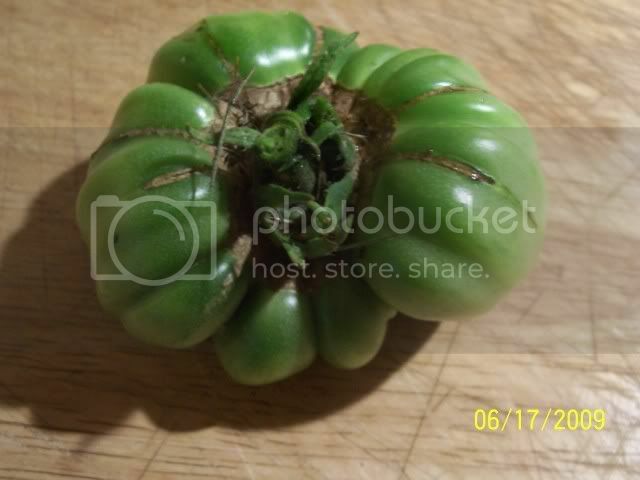 Take a look at my ugly tomatoes. Sorry about posting two pics of the same kind!! ooops! I'm pretty sure this kind of damage is caused by calcium deficiency. It's called "cat-facing". Spraying with 1:10 milk and water solution (10%) will help provide calcium immediately, as well as forestall any fungal diseases like mold. Also sprinkle lime (calcium) or dolomitic lime (calcium and magnesium), crushed oyster shells (concentrated calcium), or bone meal (calcium and phosphorous -- I don't like to use it though) to the soil. These will all raise soil pH -- make more alkaline/less acid. That is catfacing, but it is not caused by calcium issues. It is unclear what cuses it, although potassium? and weather conditions have been linked to it. It starts out as slits in small green fruit, and what you see is the result of those slits healing (scar tissue). Heirloom beefsteak varieties generally have some small proportion of fruit that catface under normal conditions, and you can get a batch of little greenies split all at the same time, indicating weather conditions caused it. If you catch it early you can snip off the affected fruit so that the plant puts more energy into perfect fruit. The radial cracking at the top of the fruit and scarring around the stem are somewhat genetic, but climactic conditions will also worsten them. Water tends to accumulate in the area after a rain and can cause rot to start, but usually it is just a surface condition, and can be cut off. Oh really? OK what's caused by calcium deficiency? ... oh I know! -- I think -- Blossom End Rot? The splitting is caused by irratic watering the skin hardens (loses elastic ability!) through lack of moisture and then when it is watered the fruit swells spliting the skins. The dark ends are 'blossom end rot' and is also a watering issue, trying looking it up. Tomatoes often split from erratic watering, being allowed to dry out and then getting a bunch of water. Splitting per se is not "catface." These do look like catfaced tomatoes.